Don’t miss the chance to get your favorite LG handsets with freebies and slashed off prices for a limited time only during LG Mobile’s 2016 Kick-Off sale. 4 amazing LG Smartphone deals all in the mid-range line of android phones, package with signature-LG features like Rear-key navigation, Gesture shot, and even Selfie Flash. One even comes with a Free LG Phone! 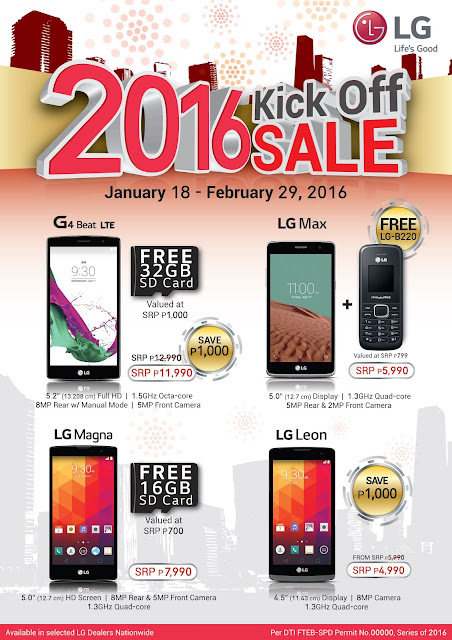 MANILA – Leading mobile technology innovator LG Electronics welcomes 2016 with a limited-time-only price promo and exclusive freebies on four of its mid-range smartphones starting January 18, 2016 until February 29, 2016. “We are excited to see what the year brings for us and this is our way of saying thanks to our loyal and new customers for an eventful year ahead in mobile,” added Jay Won.